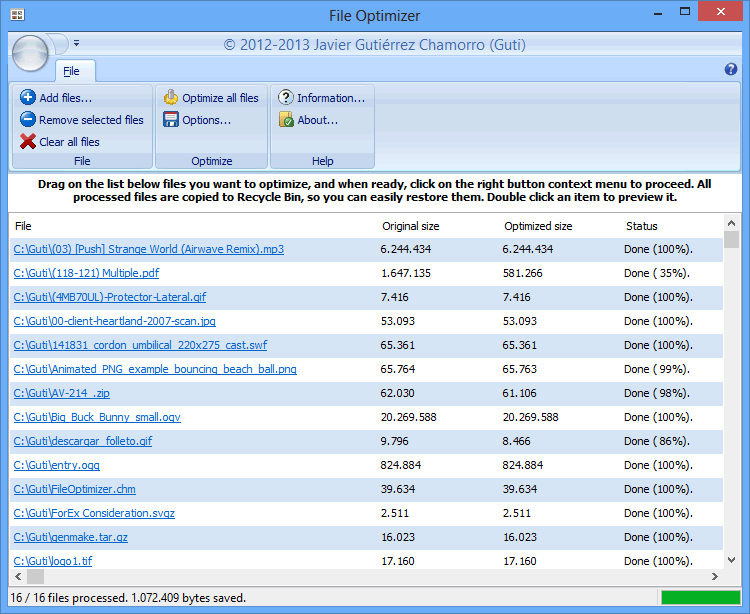 “FileOptimizer will remove additional metadata, and other unneeded information, so if you want to further modify the original files, remember to create a backup of them. Optimized files, will look identical to the original ones, but internally they will be different in order to achieve the size reduction. @woniuren, 基本是无损的啦.你贴的原文里additional metadata, and other unneeded information,这句是说移除的非核心的内容.拿图片举例子,也就是移除exif之类的吧,而非从bmp到jpg的有损转换.后面for images, bit depth reduction is used when possible.意思是一旦检测到24bit存储的图片如果实际只是用了8bit的颜色,就会转换成8bit存储.人家也说了,图片质量应不会受转换影响.